I am so over crackle nail polish, I can’t even stand it. Thankfully we have a new nail polish toy to play with, magnetic nail polish. Just like the mattes and crackles that came before it, I predict by this time next year, a majority of the major nail polish brands will have followed the magnetic trail blazed by brands like Layla and LCN. We saw this happen last summer when lesser known foreign nail polish manufacturers started coming out with crackles and now you can’t throw a rock in a drugstore without hitting a brand that has jumped on the crackle bandwagon. Of course, this isn’t the first time magnetic nail polish has caused a buzz, it just fizzled out too fast due to lack of availability. Well that isn’t the case anymore. Last month when I attended Cosmoprof North America I had the good fortune to meet the people behind Layla Cosmetics, an Italian brand who was exhibiting their line in Discover Beauty. Discover Beauty is a section of the show reserved for emerging brands hoping to find US distributorship. 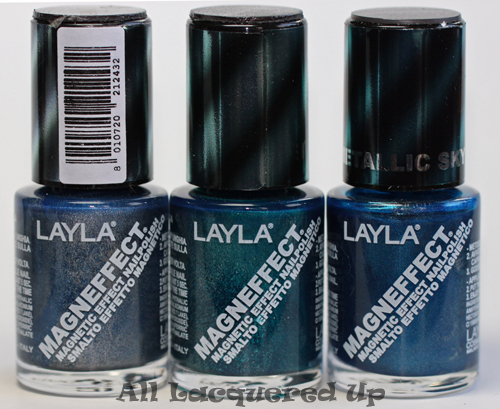 Well, Layla certainly made an impression because their Magneffect Magnetic Nail Polish is already popping up at a number of online stores. 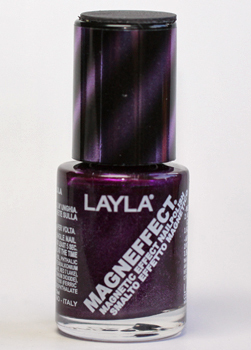 Formula & Application: Layla Magneffect magnetic nail polish is 4-Free (including formaldehyde resin) and does not include camphor, which can be an irritant. The round 10ml bottles house a long, flat brush with firm but flexible bristles. I would say the brush is the perfect balance of stiff and bendy in that it allows you to fan out the bristles but gives you great control. The polish itself is kind of thick and goopy because of the amount of pigment involved but it lays down nice and flat with no bumps. 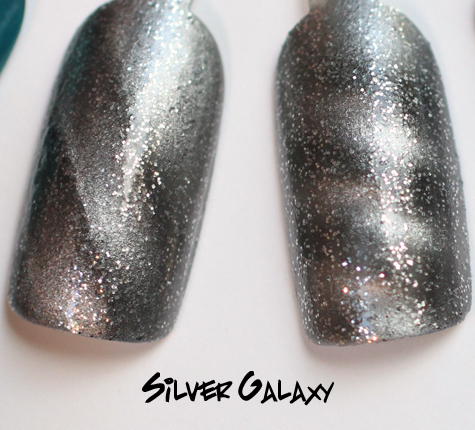 Due to the metallic particles in the polish it does dry with a brush stroke finish if you choose not to use the magnet. Also, while you can certainly get away with one coat, I found that the color and pattern were intensified when I used two coats so that is my preference. Plus, doing two coats gives you the opportunity to test your magnet holding skills. 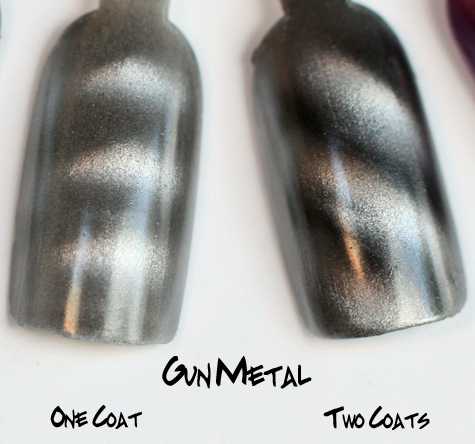 You can use the magnet on the first coat as a trial and then erase your work on the second coat. Magnetic nail polishes contain iron particles that react to the special designs in the magnets. 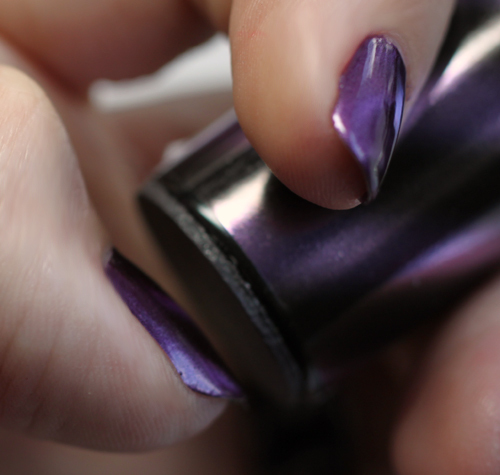 When you hold the magnet over wet nail polish, a pattern is formed that will remain once the polish is dry. 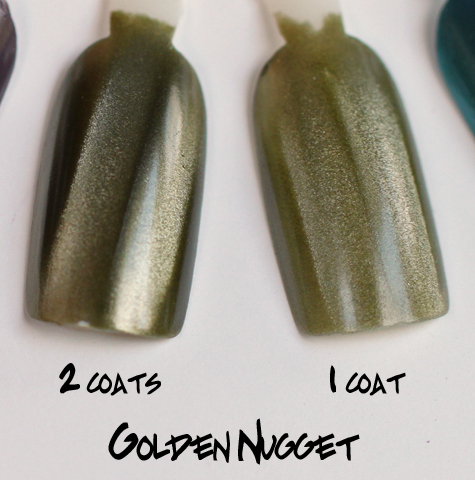 The key is to get the magnet over the polish immediately following your last brush stroke. Unlike LCN, the Layla Magneffect polishes come with the magnets on the cap. Since you have to quickly place the cap over the wet polish, I found it easier to hold the cap without the bottle attached. The time it takes to screw the cap on could negatively effect your design. Obviously I did not have a helper (ie the boyfriend) to photograph the two hand method but this gives you an idea of how to place the magnet over the polish. 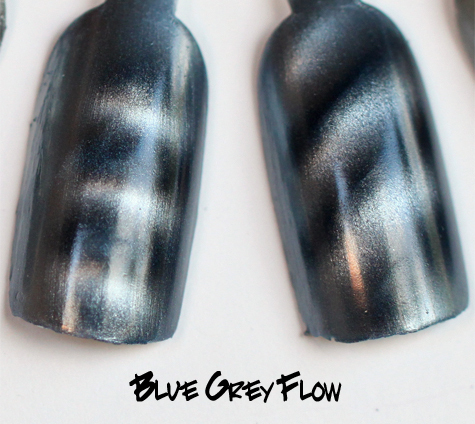 Thanks to the line embossed in the magnet, you will know which direction the lines will form in the polish. Experiment with the direction of the line. Vertical lines look very cool (see below). If you get polish on the magnet DO NOT USE ACETONE REMOVER. It will damage the magnet. Wipe it off as fast as you can with a cotton/hands down pad. Wait at least 5 minutes for the polish to dry before applying top coat. 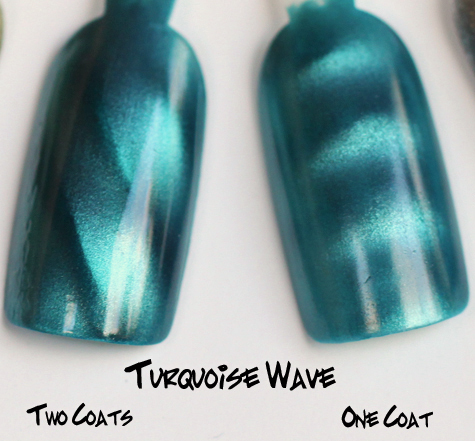 If you use two coats, like me, wait a bit more. If the polish is slightly wet, the top coat will drag the pattern. Layla Magneffect Purple Galaxy is the color I wore for the boyfriend’s birthday this past weekend. I let him choose his favorite color of the collection and this rich red grape won out. As you can see, when the magnet is applied, the base color comes through as a deep plum with the brighter metallic grape forming the diagonal lines. I alternated the direction of the lines on all my fingers and it definitely got attention. In the swatches below I used two coats of polish, except where noted. Bottom Line: I love the three dimensional quality magnetic polishes create and that they’re a simple form of nail art that even amateurs, such as myself, can handle. Plus, it’s nail art that isn’t too crazy or over the top. 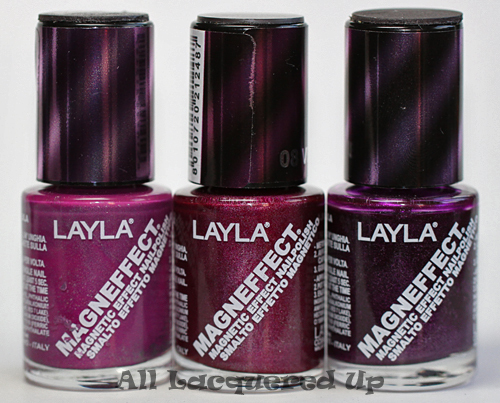 I was very pleased with the color range, pigmentation and magnet strength in the Layla Magneffect line. And it wears really well. I’ve had it on for almost a week with no chips, just minimal tip wear. Not needing to buy a separate magnet is a bonus. You know you won’t lose it since it’s attached. 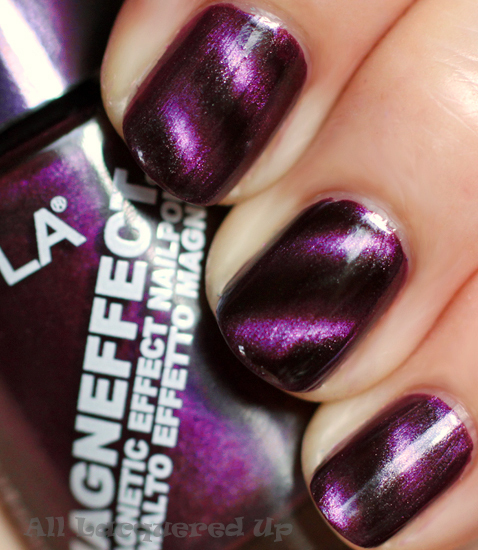 Layla Magneffect nail polish is available at select US etailers now with the rest going live tomorrow, September 1st. You can find Layla Magneffect at Zappos.com, AveYou.com, Brigette’s Boutique, Amazon.com, Drugstore.com and NailVamp.com (site launches Sept 1). 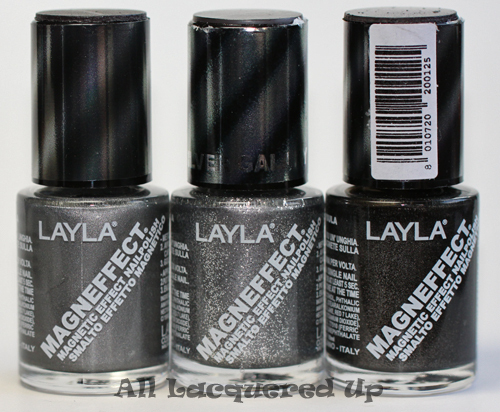 Layla Magneffect nail polish retails for $15.50/ea for a 10ml bottle with the magnet attached. Are you ready to jump on the magnetic bandwagon? What do you think of the look? 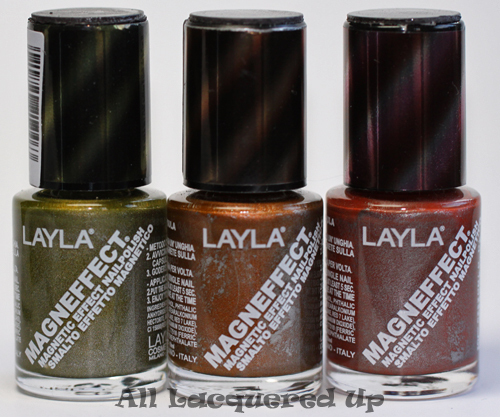 What are your favorite colors from the Layla Magneffect lineup? Which major brand do you predict to come out with magnetic nail polish first? Do you think L’oreal will revive the Star Magnet line or put out more Magnetique polishes through Lancome? Disclosure: Product samples were provided by reps for Layla Cosmetics. For more info view my Disclosure Policy. I’m not a huge crackle fan, but this is definitely I’ll have to check out. I agree, tasteful and not over-the-top. P.S. I’m a newish reader on your site and must say, I absolutely love your reviews! I seen these the other day at Lawtons (drug store chain in Canada). This definitely convinced me to pop back and pick up a couple! Looks neat! wow all the colors are really pretty! Not cheap though I will probably try one or two. Any word about these being in stores? 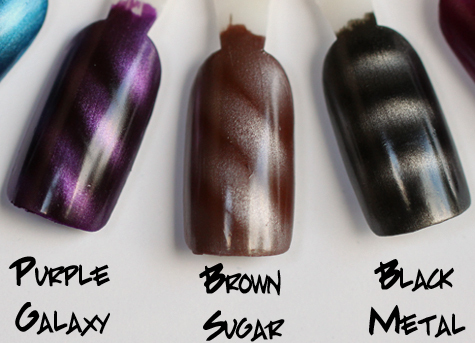 I haven’t heard of anything definite though Nails Inc is introducing their magnetic nail polish at Sephora in October. I just don’t know what the price will be. Saw Nails Inc brand online at sephora for $16. There is a 3 pack for $30, ‘coming soon’. Great review! Magnetic is the one nail polish trend I can get my boyfriend to talk about, haha. I want these real bad! I want to see how they react too different magnets. Science meets polish! Luv this! If I was going to start with just one color, which is a must have? Hmm, that’s a tough one. I think Blue Grey Flow is the one that instantly drew me in. If the boyfriend had not selected Purple Galaxy, I would have worn Blue Grey Flow. Metallic Sky rounds out my top three. Wow the color range on this brand is wonderful! I’ll have to give them a try, I like that the magnet is included. I was always turned off by the other brands that made you buy a $20+ magnet separately. ahhh these are so cool! I want! Bought a few crackles and was under-whelmed. This doesn’t float my boat so I won’t spend the money. LOVE!!!! 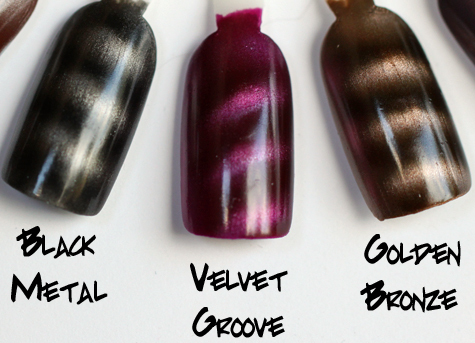 I just ordered Purple Haze, Velvet Groove, Golden Nugget and Gunmetal. Thanks for all you do. I can’t wait to get my hands on them! These are AMAZING and I can’t wait to try them!! Thank you for such an in-depth report. So this is really neat! And way more affordable than having to buy the magnet separately. I’d love to see how these polishes look without the magnetic effect too. I bet they are lovely on their own! 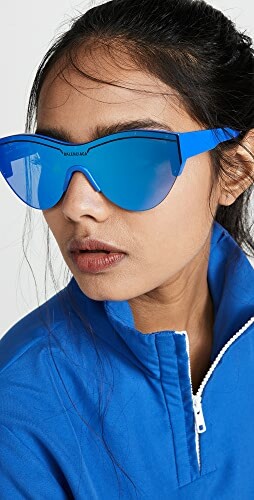 I would love to jump this bandwagon, I really really like the blue color, but I just can’t bring myself up to buying a nail polish I’d use once or twice and spend $15, I’m a college student, I can’t afford to do that, I can barely pay for my school books. BUT if I did have the money for the polish, I’d jump the bandwagon in a second! Wish I could! I like these a whole lot more than crackle, but for $15 I’m not feeling metallic stripes on my nails… I can do that with $3 drug store polishes and a paint brush. I might buy one or two for the novelty when they trickle down to the cheaper brands, but I guess I’m just not into the faux art trends. Brown Sugar is the one I like, the name fits it perfectly and it’s like a shiny, magnetic version of neutral, so I could wear it day and night. 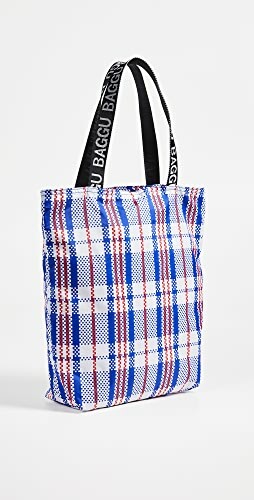 Any idea how it retails in London? The lines make the polish look smudged! QUESTION: Do these tend to dry out in the bottle fast? ( since it sounds like one coat on the nail does) I am still dealing with the crackle craze here. I do nails for a living and tend to notice the crackle polish is clumpy and separated in the bottle after owning for less than a few months. Any ideas on how to salvage crackle polish?? Thanks for all your polish posts! I always come here first for the new trends!!! I haven’t had the magnetic polishes long enough to notice any significant thickening or drying out of the polish. I’m sure in a professional environment where the bottles are opened multiple times in a day, the process is intensified. OPI has stated that you can add thinner to crackle and it won’t damage the product. Give that a try. *drools* I was waiting for these to hit the US. I was never a fan of cackle and was over it before it began. The price is kinda steep, but I picked up Purple Galaxy as a treat to myself. I have my eye on Metallic Sky, Black Metal and Blue Grey Flow. I’m going to get them one at a time so it won’t hurt my pockets as much lol! If I have to be honest, I’m bored by crackle polishes. Magnetic polishes, you are very welcome!!! Moreover, I’m really happy that an italian brand has entered the US market. Layla has good products, I don’t know if they are going to launch other collections in US, but if they will, maybe you can take a look at their Ceramic Effect collection, there are a lot of nice shades and their texture is really good. I can’t believe that for once, we here in Canada (in Halifax, Nova Scotia, no less!) have a product at the same time as the US!! I picked this baby up (same shade) last weekend but have yet to try. I can’t wait, it looks fabulous! It’s a good day when a lemming has been quelled even before it had a chance! These are super cool! I especially love Velvet Groove, it would be a bit of a splurge for a cheapskate like me, but I could call it a birthday gift to myself. I am not a fan of the crackle look at all-I’m not sure i’m even liking the magnet stuff enough to pay that price for it! I love Nails Inc though-so maybe I’d try theirs!! I am SO on board! I was a bit put off by the other brand due to the price, but since you can buy one bottle and it has the magnet…yeah I’m headed over to drugstore to put these on my list!! 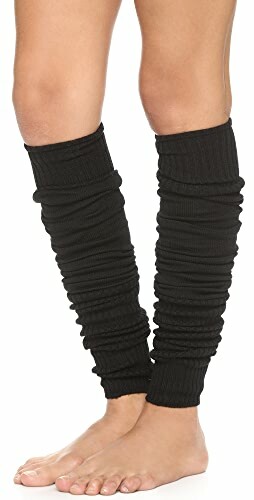 THANKS for a great review–they look awesome on you! I love this new magnet nail art! Love the variety of colors. I may wait to see if any of the major US brands come out with their own magnetics. The price is still a little to steep for me. 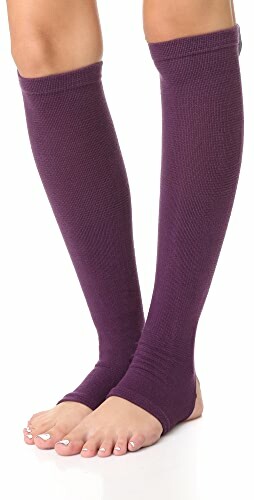 Layla is an italian brand and here in italy is not so expensive. but an OPI costs 15 euros!!! I agree with your top 3 shades! I would also throw in gun metal. I can’t wait to get my hands on these and try it out. I might just wait for them to come to stores, but I’ll def be on the lookout. You can really tell the difference between the one coat and two. This is just going to be so much fun exploring all the options and patterns you can do. So excited! I’m not finding it on zappos.com Bummer, I had a credit I could have used there. And they are one of the best online companies I’ve ever ordered from…great selection, fantastic customer service, free shipping & free returns…can’t beat that! It was supposed to launch on zappos on september 1st so it may just be a tech issue causing the delay. I definitely don’t think L’Oreal will do the magnetic thing on the L’O label or through Lancome – the latter is not able to handle the immense sales it would take with small 1-2 counter staff. The L’O polish has disappeared from all the stores I have been in since they bought Essie. I am soooo glad to hear you are also so over the crackle thing. I have been so over it since the first bottle of OPI shatter in black last Jan. I could not pick a fav…but my eye does go to the brown and the Gunmetal. I am Italian,I’ve seen magneffect but i haven’t yet buy them! Alright, I’m sold, where my wallet? I broke down after two days and bought a couple. You are an enabler in the polish addiction I have. 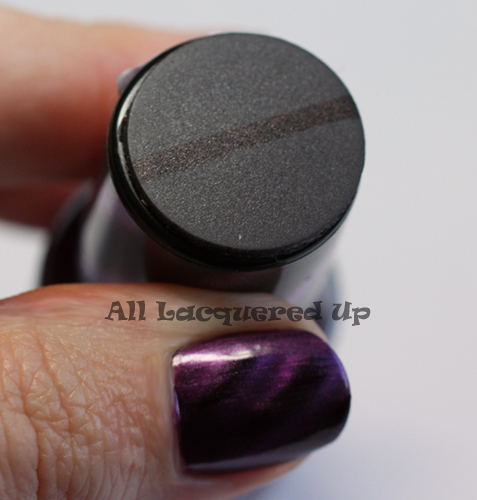 Purple & magnetic polish? SOLD! Bugger! I was told they would be on Zappos on the 1st. I’ll see what I can find out. I just got an email from Nails Inc — their “Magnetic Attractions” polishes are available for pre-order. Let the craze begin. Houses of Parliment is beautiful. Only sucky thing is that it chips fairly quickly for an expensive polish. Girl, this is the future of polish! I have two of these, but I don’t see the names on the labels. I think they are Metallic Sky and Purple Galaxy. They are GORGEOUS, and believe it or not, I found them at WALGREENS here in So. FL!!!!! PSA: I just found these at wallgreens for $11.99! While in search of LCN polishes at Lawtons I stumbled on the layla polishes. I could only find one salon who stocked the LCN and they wanted to charge 55$ for a manicure! I could only bring myself to purchase one bottle (changing violet) and I love it! I would love to have the luxury of purchasing several more bottles (one of the silver/black or blue/black polishes), but the price is a bit steep for my wallet to own several. Has anyone experimented with other magnets? 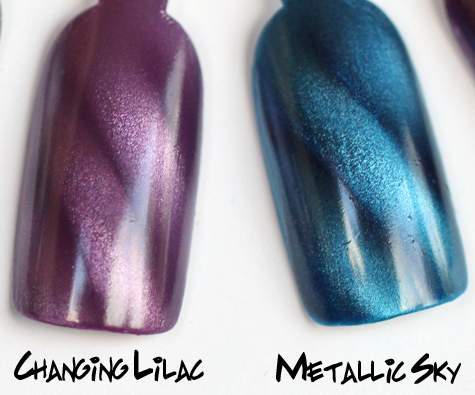 I know that LCn has the tie-dye design, I assume that would work with layla polishes…? I found that you can get a different effect than lines by quickly rotating the magnet perpendicular to the first stripes to give a neat dotting texture too. Are this nails polish better than the metallics fromEssence? Because I found the effects from Essence very disappointing! I’m from Portugal, do you know any website where I can buy some of those Layla Magneffect? I love these! I hope it’s ok to share this since I see a lot of you are looking for it. Sale ends in 4 days. You can order multiple gift certificates! Here’s the link for aveyou. Sorry i forgot to post it. I’ve always been curious what metal they use for these – iron? Copper? After your review I caved and bought some of my own. As soon as I got it I had to try it right away. My designs are as intense as yours but I think with more practice they will be. There is defiantly a learning curve.Do you know how to remove polish from the magnet? Would a non-acetone remove be ok to use on it? I bought them a while back at Walgreens for 10 bucks. They still have them for the same price. Maybe you can help me. What is the color of the UPC# 8011072021245x ? I believe that is Purple Galaxy. I just bought Nails, Inc House of Parliament and I’m kinda in love. I tried the Layla and liked it but the magnet on the NI is so much easier to use. It does the work for you. Gives you a very consisent design. Haven’t tried moving it around too much but after 7 days my mani is still going to strong and ATTRACTING (sorry couldn’t help it) much attention. I tried the Nails inc. brand and it worked perfectly. I tried the Layla brand and it did not work at all! it really works! *not as well as the pics but) i reccomend 2 coats, it comes out lots better. im so happy i bought this. Do you know where I can buy the whole set? Most websites just have them sold separately… Have you tried the china glaze version? Debating between the two since CG is cheaper…. 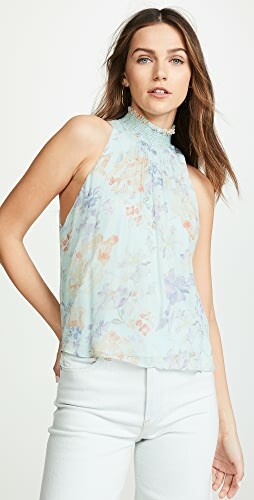 Some great tends for Spring! Aww so cute....love them. Where can i buy these. Superb tips. Thanks for sharing. Follow All Lacquered Up's board Nails on Pinterest. © 2019 All Lacquered Up. All rights reserved. Website by the Blog Movers.